The Duellists is a 1977 British historical drama film and the feature directorial debut of Ridley Scott. It won the Best Debut Film award at the 1977 Cannes Film Festival. The basis of the screenplay is the Joseph Conrad short story "The Duel" (titled "Point of Honor" in the United States) published in A Set of Six. In Strasbourg in 1800, fervent Bonapartist and obsessive duellist Lieutenant Gabriel Feraud (Harvey Keitel) of the French 7th Hussars, nearly kills the nephew of the city's mayor in a sword duel. Under pressure from the mayor, Brigadier-General Treillard (Robert Stephens) sends a member of his staff, Lieutenant Armand d'Hubert (Keith Carradine) of the 3rd Hussars, to put Feraud under house arrest. As the arrest takes place in the house of Madame de Lionne (Jenny Runacre), a prominent local lady, Feraud takes it as a personal insult from d'Hubert. Matters are made worse when Feraud asks d'Hubert if he would "let them spit on Napoleon" and d'Hubert doesn't immediately reply. Upon reaching his quarters, Feraud challenges d'Hubert to a duel. The duel is inconclusive; d'Hubert slashes Feraud's forearm but is unable to finish him off, because he is attacked by Feraud's mistress. As a result of his part in the duel, d'Hubert is dismissed from the General's staff and returned to active duty with his unit. The war interrupts the men's quarrel and they do not meet again until six months later in Augsburg in 1801. Feraud immediately challenges d'Hubert to another duel and seriously wounds him. Recovering, d'Hubert takes lessons from a fencing master and in the next duel (held in a cellar with heavy sabres), the two men fight each other to a bloody standstill. Soon afterwards, d'Hubert is relieved to learn he has been promoted to captain. Military discipline forbids officers of different ranks from duelling. The action moves to 1806 when d'Hubert is serving in Lübeck. He is shocked to hear that the 7th Hussars have arrived in the city and that Feraud is now also a captain. Aware that in two weeks time he is to be promoted to major, d'Hubert attempts to slip away but is spotted by Feraud's perpetual second. Feraud challenges him to another duel, which is to be fought on horseback with sabres. D'Hubert slashes his opponent across the forehead; Feraud, blinded because the cut bleeds heavily into his eyes, cannot continue the fight. D'Hubert considers himself the victor and leaves the field ebullient. Soon afterwards, Feraud's regiment is posted to Spain. The pair chance upon each other, during the French Army's disastrous retreat from Moscow in 1812. Before they can resume the duel, Cossacks attack, forcing d'Hubert and Feraud to fight together, rather than each other. Feraud's animosity towards d'Hubert remains undimmed, however. Two years later, after Napoleon's exile to Elba, d'Hubert is a brigadier-general recovering from a leg wound, at the home of his sister Leonie (Meg Wynn Owen) in Tours. She introduces him to Adele (Cristina Raines), niece of her neighbour (Alan Webb). The couple fall in love and are married. A Bonapartist agent (Edward Fox) attempts to recruit d'Hubert, as rumours of Napoleon's imminent return from exile abound. D'Hubert refuses to command a brigade if the Emperor returns from Elba. When Feraud, also a brigadier-general and a leading Bonapartist, hears this he declares d'Hubert is a traitor to the Emperor. He claims that he always suspected d'Hubert's disloyalty, which is why he challenged him to a duel in the first place. After Napoleon is defeated at Waterloo, d'Hubert joins the army of Louis XVIII. Feraud is arrested and is expected to be executed for his part in the Hundred Days. D'Hubert approaches the Minister of Police Joseph Fouché (Albert Finney) and persuades him to release Feraud (without revealing d'Hubert's part in his reprieve). Feraud is paroled to live in a certain province under police supervision. After Feraud learns of d'Hubert's promotion in the new French Army, he sends two former officers to seek out d'Hubert, so he can challenge him to a duel with pistols. Eventually the two men meet in a ruined château on a wooded hill. Feraud rapidly discharges both his pistols, before being caught at point blank range by d'Hubert, who refuses to shoot him because tradition dictates he now owns Feraud's life. He tells Feraud he must submit to his decision, that in all future dealings with d'Hubert, Feraud shall conduct himself "as a dead man". The duel ends and d'Hubert returns to his life and happy marriage, while Feraud returns to his provincial exile. The closing image of the film depicts Feraud in silent contemplation, gazing at the horizon in utter solitude unable to pursue the obsession that has consumed him for so many years. The Conrad short story evidently has its genesis in the real duels that two French officers fought in the Napoleonic era. Their names were Dupont and Fournier-Sarlovèze, whom Conrad disguised slightly, changing Dupont into d'Hubert and Fournier into Feraud. As a young officer in Napoleon's Army, Dupont was ordered to deliver a disagreeable message to a fellow officer, Fournier, a rabid duellist. Fournier, taking out his subsequent rage on the messenger, challenged Dupont to a duel. This sparked a succession of encounters, waged with sword and pistol, that spanned decades. The contest was eventually resolved when Dupont was able to overcome Fournier in a pistol duel, forcing him to promise never to bother him again. They fought their first duel in 1794 from which Fournier demanded a rematch. This rematch resulted in at least another 30 duels over the next 19 years, in which the two officers fought mounted and on foot, with swords, rapiers, and sabres. The main locations used for shooting the film were in and around Sarlat-la-Canéda in the Dordogne region of France. The scenes set during the retreat from Moscow were shot in the Cairngorms of Scotland, near Aviemore. The final duel scene was filmed at Château de Commarque. The film holds a 92% "Fresh" rating on Rotten Tomatoes based on 24 reviews, with an average score of 7.2/10 and the critical consensus: "Rich, stylized visuals work with effective performances in Ridley Scott's take on Joseph Conrad's Napoleonic story, resulting in an impressive feature film debut for the director." The film has been compared to Stanley Kubrick's Barry Lyndon. In both films, duels play an essential role. In his commentary for the DVD release of his film Scott comments that he was trying to emulate the lush cinematography of Kubrick's film, which approached the naturalistic paintings of the era depicted. Vincent Canby of The New York Times wrote: "The movie, set during the Napoleonic Wars, uses its beauty much in the way that other movies use soundtrack music, to set mood, to complement scenes and even to contradict them. Sometimes it's all too much, yet the camerawork, which is by Frank Tidy, provides the Baroque style by which the movie operates on our senses, making the eccentric drama at first compelling and ultimately breathtaking." Pauline Kael of The New Yorker wrote, "'The Duellists' is an epic yarn; we sit back and observe it, and it's consistently entertaining—and eerily beautiful." Gene Siskel of the Chicago Tribune gave the film two-and-a-half stars out of four and wrote, "The story might have worked if there were an undercurrent of attractiveness to Keitel's loutish character. But he is an unwavering boor from start to finish, and his prowess with weapons is in no way redeeming." Variety wrote that Ridley Scott "does have an eye for fine compositions, period recreation and arresting tableaus. But it is somewhat surface and too taken up with poses ... it rarely illuminates the deeper human aspects of these two flailing men." Charles Champlin of the Los Angeles Times wrote that the sword fights were "the best I've ever seen" and called the story "refreshingly different from standard film content." Michael Webb of The Washington Post wrote, "The film has the pictorial beauty and rich period sense of 'Barry Lyndon,' but adds the narrative drive and passion that Kubrick's film lacked." David Ansen of Newsweek wrote, "The best you can say about the film - the directing debut of Ridley Scott - is that it provides an unusually civilized experience in these days of movie barbarism ... The worst that can be said is that Keitel and Carradine are so perversely cast as French hussars that, whenever they speak, the splendid illusion of nineteenth-century Europe is shattered." The film is lauded for its historically authentic portrayal of Napoleonic uniforms and military conduct, as well as its generally accurate early-19th-century fencing techniques as recreated by fight choreographer William Hobbs. The military adviser was military historian Richard Holmes. On 29 January 2013, Shout! Factory released the film on Blu-ray. The release coincided with the publication of an essay on the film in a collection of scholarly essays on Ridley Scott. ^ "Festival de Cannes: The Duellists". Festival-Cannes.com. Retrieved 10 May 2009. ^ Evangelista, Nick (1995). The Encyclopedia of the Sword. Westport, Connecticut: Greenwood Press. p. 187. ISBN 0-313-27896-2. ^ "The Duellists (1977)". Rotten Tomatoes. Flixter. Retrieved 23 December 2018. ^ Canby, Vincent (January 14, 1978). "New Movie, 'The Duellists,' Is Set During Napoleonic Wars". The New York Times. 10. ^ Kael, Pauline (January 23, 1978). "The Current Cinema". The New Yorker. 80. ^ Siskel, Gene (April 2, 1979). "'The Duellists': Pretty, but plot is a lost cause". Chicago Tribune. Section 2, p. 7. ^ "Film Reviews: The Duellists". Variety. June 1, 1977. 17. ^ Champlin, Charles (January 27, 1978). "Taste of Steel in 'Duellists'". Los Angeles Times. Part IV, p. 1. ^ Webb, Michael (June 3, 1977). "Cannes Festival: A Case of Expecting the Worst—and Getting It". The Washington Post. B4. ^ Ansen, David (January 30, 1978). "Misfire". Newsweek. 55. ^ "The Duellists: it takes two to tangle". The Guardian. 10 January 2016. ^ "The Duellists Blu-ray". Blu-ray.com. Retrieved 5 February 2014. ^ "A Double-Edged Sword: Honor in The Duellists", in The Culture and Philosophy of Ridley Scott, eds. Adam Barkman, Ashley Barkman, and Jim McRae (Lexington Books, 2013), 45-60. Wikimedia Commons has media related to The Duellists. 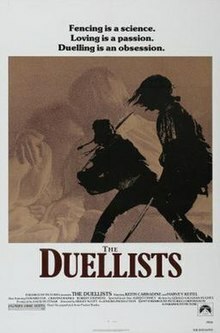 "The Duel" – Full text of the short story by Joseph Conrad on which the film is based.